Nu, What Happened to the "Free Jonathan Pollard" Campaign? It had looked like things were finally moving, and then... he's still in that American prison. Former Central Intelligence Agency head R. James Woolsey called upon US President Barack Obama on Monday to commute the sentence of Israeli agent Jonathan Pollard. In an interview with Channel 2, Woolsey said Obama should not ask for diplomatic concessions from Israel in return for Pollard. He said America regularly catches spies, but they don't serve 25 years in prison and that after examining the entire case and others like it, he believes Pollard should have left prison five years ago when he first called for his release. It's a real disgrace to the American Judicial system that Pollard has been in jail so long. He has served more than double what could be justified. And considering the difficult harsh conditions of his imprisonment, he should have had been released with very generous financial compensation for the uncalled for cruelty by the American Government, successive American Governments. And Israel didn't do any better. They abandoned him to the Americans. Now, let's bring Pollard home. In an ironic sense, should we be thankful for Bibi's ten month building freeze and threat of more for lighting a fire under contractors and private citizens here in Judea and Samaria? L'havdil, to differentiate--it's different, I think of all the communities, like Shvut Rachel just to the east of us, established as a response to Arab terrorists murdering innocent Jews. If only we had built those communities earlier, would our friends and family still be alive? That thought haunts me. I guess it always will. Rachella Druk's grandchildren only know pictures, stories and a grave in the Shiloh Cemetery. But I must be joyful at the amount of building going on here in Shiloh and other communities. Families are coming from all over the country to buy homes here. They like the location, easy traveling to both Jerusalem and the Petach Tikva-Hod Hasharon area. We're also just minutes from the Jordan Valley. And we have schools and all sorts of activities. There are also stores, food, clothes and toys. And for those lucky enough to feel, to sense it, the spirit of Biblical Chana and the Ketoret are here, too. 1- The uprising began as a request for change, not necessarily Mubarak's expulsion, chiefly by moderate bloggers and activists and NOT by the Muslim Brotherhood or any other fundamentalist Islamic group. 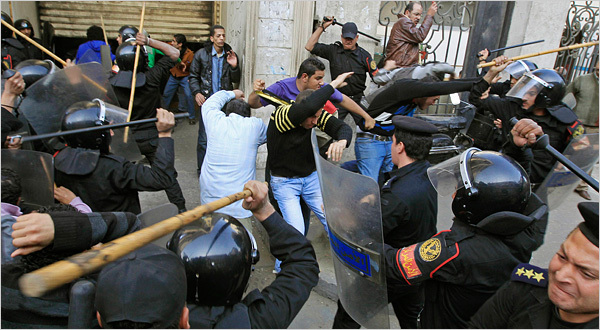 2- Mubarak has purposely caused mayhem and increased public fear since the start of these 'days of rage,' as the locals call them, by releasing dangerous criminals from prison to loot, allied by Egypt's notorious secret police. (This in order to 'convince' the populace that they need big strong Daddy Mubarak to keep order.) How has this become apparent? The neighborhoods of Egypt have divided themselves into vigilante groups according to sections of major cities such as Alexandria and Cairo. These groups made up of civilians wishing to protect their shops and homes have caught several looters holding identity cards of the aforementioned secret police. 3- By ordering the police to use live rounds against its own populace, it is too late for Mubarak to save his skin other than a) slaughtering his people in a nationwide Tiananmen Square type massacre or b) resigning. When he does leave his post, a vacuum will be left. Who is most able to quickly seize the reigns? The much strangled Muslim Brotherhood which has an infrastructure and hierarchy unlike the moderates who have no party; no organized written agenda; and need the one thing that history will not allow them: TIME to get organized. 6- What now? I will share with you something I posted in a comment on this blog. I am in touch with a non-Jewish sister of an elderly giyoret I visit at the local geriatric home here in Netivot. These are her words from last night, e-mailed from Paris: "... I am following what is happening in Egypt--I have special news sources for intelligence reports-- and one of them has sent an Alert that all Egyptian troops; guards; etc. have disappeared from the Gaza border with Egypt, and that Chamas operatives are freely crossing over to meddle with Egypt's 'revolutionary' groups." Open borders mean full scale importing of rockets; terrorists and hundreds if not thousands of Sudanese and other African refugees who have already grossly affected life in areas such as southern Tel Aviv, Eilat and Arad. 7- Plan of action? Daven, pray and pray some more! May we merit the coming of Moshiach speedily. At least we have the present rain to be grateful for at this time of tense expectation. The only problem is that it's not a laughing matter. But this skit is really great. They showed it on tonight's IBA newscast, and I was very happy to find it on the Jerusalem Post internet site. With Mubarak on His Way Out, How Many Years Until Stability Returns to Egypt? I have no doubts that it will take many years for Egypt to fully calm down. This isn't a simple western-style government change. The rioters are making demands; they're not working to rule better, more fairly. It's very naive and unrealistic to expect good government by western standards. Maybe things will improve, but not immediately. And I'm not saying that Mubarak was good, but if Obama is so sympathetic to the rioters' demands, he should have been putting pressure on Mubarak to make changes for the past two years. Instead of doing that, the Obama government has been putting pressure on Israel to discriminate against Jewish Civil Rights. I just hope that all these riots, in Tunisia, Egypt and ? will take the pressure off of us. Take a look at Chavi's third attempt at Havel Havelim. She has done a great job, so pop over for a visit to read the great variety of jblog posts. 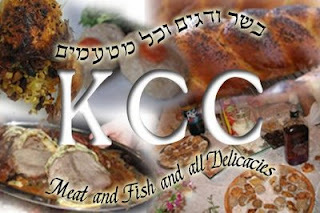 And talking about jblogs, the next Kosher Cooking Carnival will be this week at Mrs. S.'s Shiputzim. It's a monthly carnival which includes all aspects of kosher food, from halacha Jewish Law to recipes and also kosher restaurant and cookbook reviews. Send your posts in as soon as posted, so you won't forget. In the aftermath of the Carmel fire, there has been an expected outpouring of support from Christian evangelical and messianic groups. Statements and appeals coming from Israel’s Prime Minister's Office, Tourism Ministry and the Jewish National Fund (JNF) indicate that post-fire funding is being actively solicited from the evangelical community. There are evangelical groups which are partnering with the Jewish Agency, the Jewish National Fund, Israel Bonds, and United Israel Appeal while actively targeting Jews for conversion – and reporting their "successes" right down to the number of baptisms. What Is Tsippi Livni Trying To Sell the State of Israel, Innocent Israeli Citizens? If giving the Arabs our Land won't give us peace, then why even try it? MK Tzipi Livni: The idea that some [settlers] will remain by the grace of the Palestinian state and Palestinian security appears to me to be very problematic. Channel 2 reporter Udi Segal: If you think that the Palestinian state that will be established will murder Israeli citizens who remain there -- that we are going to make a peace arrangement with these murderers? Either there will be peace or there will be a band of murderers. Livni: I never sold peace in the sense of "new Middle East"[AL: a phrase coined by Shimon Peres]. We live in a harsh neighborhood. The "new Middle east" isn't going to plop down on us tomorrow and were aren't going to be living in different surroundings." I'm pretty sure that the general consensus (not me, of course) had been that Israel could count on Egypt's Mubarak as a stable ally, peace partner/broker etc. Remember that a treaty is only as good as the power stability of the signees. Especially in the Arab world, you can't expect a political leader to follow the policies, treaties of predecessors, especially if they violently overthrew that predecessor on the way to power. That's why Israel should be taking what's going on in Egypt very, very seriously. There's a violent uprising against the government. Hosni Mubarak had been trying to install his son Gamal to succeed him, but instead of that, Gamal and mother have fled the country. The United States and the New York Times seem to have already written off Mubarak and are showing sympathy to the rioters. That's bad news for world peace. Obama is by far the most left-wing president the US has ever had, and his thinking conforms to a certain pattern. In broad strokes, I perceive those on the left as believing that problems can be solved with good will, by reaching out, and by promoting dialogue. They believe that confrontation is counter-productive (if not just plain wrong), and they are more ready to be appeasing. While those on the right see the reality of evil and believe that what is required sometimes is to boldly identify it and then undertake a strong confrontation with it (with the conviction that to fail to do so would be wrong). Obama's efforts with regard to Iran have been a disaster, because he has drawn on his ideology in attempting to solve the problem of Iranian intransigence. Netanyahu is correct when he says that efforts with Iran won't succeed unless Iran knows there is a credible threat of military action. Obama declines to play it this way. Similarly he has opted to send an ambassador to Syria, claiming that having a US spokesman on the scene will allow for a better exchange of ideas, present opportunities for increasing US influence, etc. etc. But, in reality, he is effectively rewarding Syria for hostile and belligerent actions, and giving it the wrong message. Syria should have been isolated to the maximum. As a result of the way Obama plays it, US deterrence power in the Middle East has dropped. This encourages boldness on the part of terrorist groups, and terrorist-supporting states. It is counterproductive to peace. And this, I believe, Obama does not understand. I believe he is badly deluded. Do I think Obama is a closet jihadist who secretly desires the hegemony of Iran or the emergence of a new caliphate? Do I think that he sees it as a victory, that terrorists are feeling stronger? I most certainly do not. What I do believe is that Obama is an internationalist, who curtails American power deliberately. But in the course of curtailing that power, I strongly suspect that he has generated some unintended results. Nobody could say it any better. This week when I visited my grandkids I got to see my eldest grandchild's report card. No surprise that her grades were excellent. This is about a different type of report card. The criteria in elementary school isn't the same as for politicians. The politicians are elected to promote the policies they campaign for. Unfortunately, most politicians consider getting elected as their top aim and therefore say and sign anything that they think will give them the votes. Israel has multiple parties, each with a distinct ideology and history. Governments are made of coalitions, various parties that agree on basic policy and are willing to work together. That's the theory. In practice the only basic policy seems to be MK's ambitious enough to accept whatever ministry the Prime Minister-hopeful can invent to glue him/her to the government coalition. The result is that regardless of what the party and MK-hopeful proclaims when campaigning, we can be very surprised by them in office. A perfect example would be Ariel Sharon's rather Right, pro-Jews in the Land of Israel campaign and then springing Disengagement-the destruction of Jewish communities and creation of homeless Jewish DP's refugees. Mattot Arim has done a fantastic job in tracking and grading the activities of our Knesset Members and Ministers. IMRA has posted it, and it's worth the read. And just to give you what I consider the highlight and reminder that the most reliable Israeli political party is Ichud Le'umi, National Union. Compare it to the NRP Bayit Yehudi. Of course it's a no-brainer to recognize that the Likud is not Right, pro-Jews in the Land of Israel. Likud PM Binyamin Netanyahu has made it very clear that he's promoting a Center friendly to the Left government. Take this as a serious guide to know how to vote next elections. Well, Israel wasn't mentioned in United States President Barack Hussein Obama's State of the Union speech. I consider that very good news. The biggest danger to the State of Israel is the pressure to "make a deal" with the Arabs who want us dead and destroyed. So I'm very glad that Obama ignored the subject. 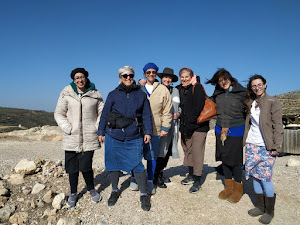 Twenty years ago when my eldest was doing her national service in Kiryat Shmoneh (a development town-city in northern Israel,) she reported to us that many teachers and parents objected to school trips to Israel's Capital City, Jerusalem. So, here we are a generation later, things haven't changed much. The Education Ministry is still trying to get Israeli students to Jerusalem. Israel is a small country and it's possible for all students, except in the area of Eilat, to make a day trip of touring Jerusalem. A tour of Jerusalem must include the ancient, Biblical and religious aspects along with a view of the Knesset. Too many Israelis don't visit Jerusalem, aren't familiar with it at all. Another place which should be on the must see itinery is Shiloh. It was our capital city before King David moved everything to Jerusalem where he wanted to build the Beit HaMikdash, Holy Temple. 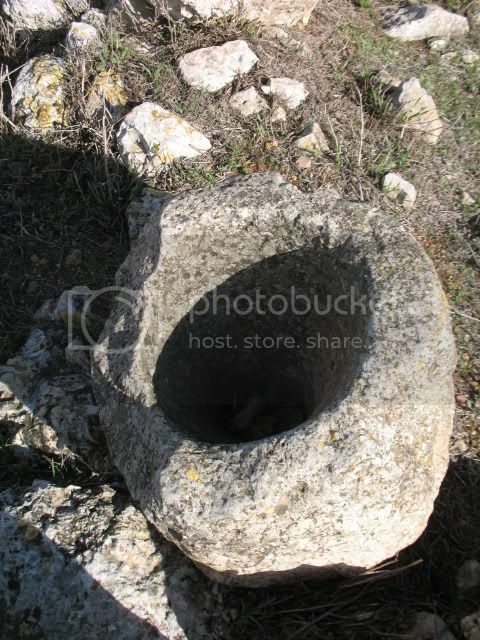 That was later built by his son, King Solomon. 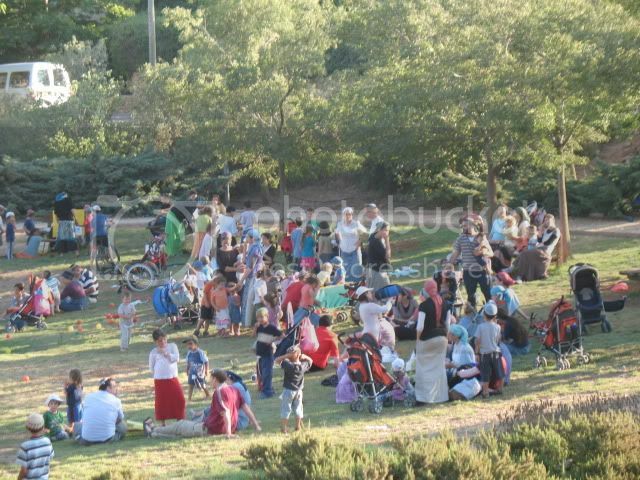 Today there's a vibrant Jewish community in Shiloh and facilities for tourists at the ancient Tel Shiloh. Shiloh was the Capital for 369 years, from the time of Joshua until the Prophet Samuel and King Saul, yes, the period of the Judges. It was Shiloh where Chana prayed for a son who would lead the Jewish People out of their cycle of sin and be saved and then sin again. Her son was Samuel the Prophet, who annointed our first two kings, Saul and David. Amazing, two weeks in a row we hosted strangers for Shabbat. The week before we had an intrepid guest who arrived almost miraculously. And this past week there was a student who considered us and our neighbors research material. Did she come to pick my brain? Maybe. She made it very clear before she came that she isn't Jewish, so we shouldn't be surprised. That was fair. Of course if we needed a "shabbos goy," we'd have our very own. We didn't need one. Nu, so we were expecting a non-Jew. We didn't expect to host a non-Jew more familiar with Jewish customs and prayers. She was raised in an area with many Jews. Many of her childhood friends were Jewish, and she probably attended more Bar/Bat Mitvvot than I did. She attended the prayer services and couldn't wait to go to our synagogue to see if anything was familiar. When she discovered that I had been in NCSY, a chapter, regional and national officer, she really got excited. Her childhood friends were also in NCSY, and she had wished that she had activities like theirs. My friends were mainly Jewish, except in my early time in Great Neck. Great Neck North Jr. High School separated the "new" and "veteran" students in the girls "Home Ec" classes. Anyone who wasn't a student there from the 7th Grade was in a "special class." I moved there for the 8th grade, and the Catholic girls entered the school in the 9th grade. That's when I was one of the few Jews in class class, and I got to know the Catholic girls. Home Ec and Sewing were the only classes where I studied with a large percentage of non-jews. For me the school felt very "Jewish," sociologically, not religiously. I never really thought about how it was for the non-Jewish friends of Jews who would find themselves invited to all sorts of Jewish events. Now, honestly, I got a kick out of discovering that this intelligent young woman, whom we hosted, finds Judaism attractive and was glad to visit us and experience even more. After all that fanfare, good wishes from his best buddy, the United States President Barack Hussein Obama and oodles of campaign donations, Rahm Emanuel failed the crucial qualifying test to run for the Chicago mayoralty. According to the court there, he hasn't been living in Chicago. As anyone who reads the news from the states knows, Emanuel has spent the last year working for and with the US President. Being a family man, he took his family with him to Washington DC, and they rented out their house. Legal experts have offered widely diverging views of what the state’s municipal code means when it refers to legal residency. Supporters of Mr. Emanuel, who was born in Chicago and represented a Congressional district here for years, say legal residency is a matter of “intent” and whether he always intended to return from Washington after the White House — a circumstance they argue is backed up by his owning a house here (though a tenant has rented it for now), voting here, paying taxes here, and leaving his most prized possessions (including his wife’s wedding dress) here. Others — including two of the Illinois appellate justices issuing the ruling on Monday — say that physical presence is needed, and that service at the White House provides no special exception. Some here were hinting that they sensed old-school Chicago politics in the ruling, particularly in a state where judges are elected and local party leaders sometimes support them, but others dismissed such notions. The appellate court justices who held the majority in the case — Thomas E. Hoffman and Shelvin Louise Marie Hall — have run as Democrats, court officials said, and Mr. Hoffman, who wrote the ruling and has served 17 years as an appellate judge, was widely lauded by colleagues for his past legal analyses. So, what's Mr. Emanuel going to do now, besides appeal? I find this ironic, so similar but with different results to the controversy surrounding Obama's birthplace. Americans are divided as to whether he was born in Africa or Hawaii. The Republicans didn't fight this to the end, because McCain's birthplace is only "technically" the United States of America. He was born in the Panama Canal Zone. McCain was born on a military installation in the Canal Zone, where his mother and father, a navy officer, were stationed. His campaign advisers say they are comfortable that McCain meets the requirement and note that the question was researched for his first presidential bid in 1999 and reviewed again this time around. 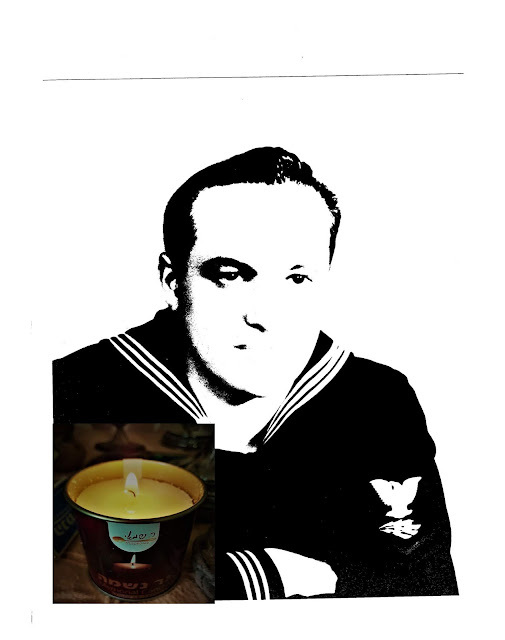 It would have been a real slap in the face to the United States military personnel not to accept a son or daughter of a high-ranking Navy officer, like McCain as "kosher" to be U.S. President. "It's whatever five out of nine Supreme Court Judges say it is." In a sense it's random luck, depending on which judges are making (voting on) the decision. So far, it seems like "lady luck" isn't with Rahm Emanuel. Minutes of a post-Annapolis plenary session on Territory. Both sides discussed news reports regarding Israel's decision to negotiate with Syria over the return of the Golan Heights. However, the majority of the conversation focused on border and territory issues, particularly those regarding East Jerusalem and No Man's Land. 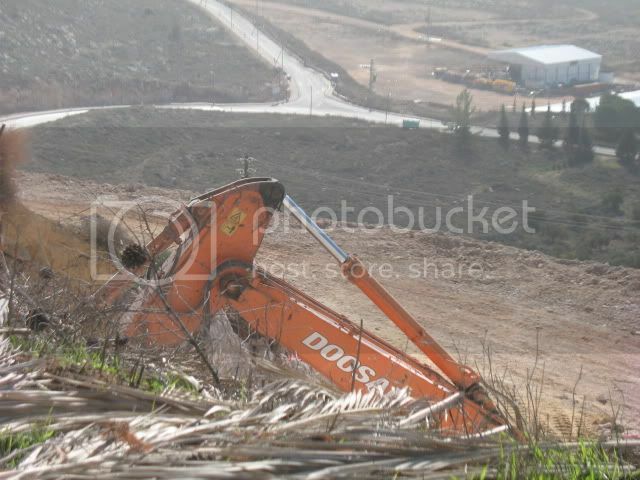 The Israeli side presented their assessment of the Palestinian land swap proposal. Today I had the BBC World News on TV and by chance heard/saw their program Impact. There was a young woman interviewing the Pseudostinian aka Palestinian sic representative to Great Britain about the P-Leaks. She seemed to be chastising him for offering his territory to Israel. He was having a tough time trying to defend and deny it all. Now, this may come as news for that "reporter" and most of the world media, politicians etc, but there never was any independent country here in the HolyLand other than Jewish ones. The Land is ours and ours alone. I hope and pray that the hullabaloo over the P-Leaks will stop the talks before more harm is done! Considering the latest revelations about the "napkin map" and various agreements, proposals and recognition of Israeli sovereignty over Jerusalem, the betting political pundit would be taking bets for the PA's Mahmoud Abbas's single versus double-digit years' survival or just disappearing with his nearest and dearest. Even I'm surprised. I was sure that only Israel was cursed with such daring and creative politicians, like Avigdor Lieberman and the comatose Ariel Sharon, who propose/d plans to give Arabs our Land, even though they contradict/ed their official election platforms, promises and ideologies. The Arabs aren't as tolerant and fatalistic as Israelis and Jews. Lieberman keeps talking with "forked tongue," and G-d has punished Sharon by leaving him breathing but without a functioning brain. And Yossi Beilin was never punished for negotiating the Oslo Accords as a private citizen, not representing the elected Israeli government. Now, about Abbas, am I betting? No way! I'm just a pundit, a pragmatic political observer. Of course, I may be wrong, but I can't imagine Abbas surviving very long now that these revelations are out. Nu, do you agree? Yes, there's nothing like Latma for the Right way of thinking! Jewish Israel's Ellen Horowitz has been blogging on this site/blog since before there was a Jewish Israel site. And even now I encourage her to post here, because I consider the information on Jewish Israel to be extremely important and am proud to participate in their information campaign. That's the reason I consider it very important to publicize their Hebrew site, yes, Jewish Israel in Hebrew. Please pass the link around to Hebrew readers, who can't get the necessary information from the English Jewish Israel. Do you think France's Foreign Minister, Michèle Alliot-Marie, was surprised when demonstrators began to riot and pelt her with eggs during her visit to Gaza? If the Gazans are so poor, why did they waste all those eggs? Eggs are very healthy, the perfect, complete protein. "...she called on Israel to lift its blockade of Gaza, saying it had increased poverty and fed violence." 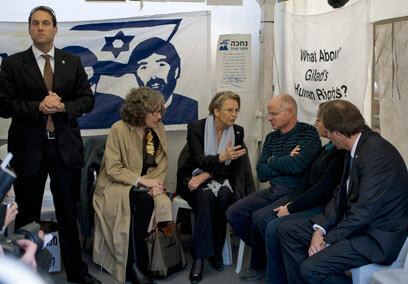 It's believed that the rioters were angry, because Michèle Alliot-Marie had expressed support for releasing Gilad Shalit from captivity. Following the meeting, Israeli radio posted a story on its Arabic-language website in which it quoted Alliot-Marie as saying that the European Union "must condemn the war crime that Hamas is comitting by keeping Gilad Shalit in captivity." What she had actually said was that she would "pass on a message (to the EU) that the prisoner should receive Red Cross visits." I wonder if the eggs knocked some sense into her. Visits from the Red Cross to Gilad Shalit aren't enough. Too many years have passed. He must be returned home to his family in Israel. If the Red Cross wants the honor of bringing him home, fine, but just to visit him isn't enough. One of the reasons why is dangerously futile to negotiate with the present Pseudostinian aka Palestinian sic leadership is because they aren't all that popular. Corruption is routine, and the ordinary Arab is well aware of it. I don't know if they want straight honest government. My guess is that they want a piece of the pie, and the present leadership is very nervous about that. That's why they don't want any pro-Tunisian-type demonstrations. You can't count on treaties made with unstable regimes. It's like trying to do business with a company about to go bankrupt. We must ignore all the pressure from Obama, Clinton, Blair etc. Obama wants to run for a second term which is good news/bad news. Actually, I should have written bad news/good news. The bad news is that he'll start off trying to push Israel into a deal, because he thinks it will get him votes. But the good news is that he'll want an easy "victory" for his agenda and will back off quickly if we fight him, especially if the Jewish and pro-Israel lobbies make him look like a pro-Arab terrrorist bully. ...and there's no reason why we can't do this gracefully and with flair. Jews and Arabs, Can We Live Together-Nearby Peaceably? I had been thinking of writing about my day at work. I work at Yafiz (of Rami Levi) in Sha'ar Binyamin, north of Jerusalem. There are two parts ot my job. One is to keep the stock neat and attractive and the second is to help the customers choose/buy our clothes. The media has made a big deal about the fact that Arabs shop in the Rami Levi stores in Gush Etzion, Mishor Adumim and Sha'ar Binyamin. In Jerusalem you can find Arabs shopping in the downtown stores and in the malls. It's not newsworthy, but I figured that some of my readers would be curious to know how I deal with Arab customers. A customer is a customer. I'm there in Yafiz to sell clothes. I didn't think about the chance of Arabs going into the store when I took the job. Before I became an English teacher I worked in a bagel store and sold ready-made bagel sandwiches, salads, pastries and sodas to hitech workers in Har Chotzvim as part of my job. For the first few months I sometimes had a driver/assistant, a young Arab who was also the pastry chef. I didn't expect to have to work with an Arab, but his job made mine easier. We got along fine. And now at Yafiz when there are Arabs looking at our stock, I go over to help, the same as I do for anyone. Sometimes it's hard to tell they're Arabs unless they're talking to one another or on their cellphone. They don't usually shop alone. The men have no problem speaking to me in Hebrew, but the women need English, and some of them aren't really fluent. We manage. They like the clothes and the prices. So, it was rather ironic to get this video from IMRA. At 3:11 in the recording posted 15 January 2011 apparently filmed that day, the Arab says "next time it won't pass this way. Next time it won't pass this way. I repeat to you." Islamic organizations in Jaffa incited a Torah garin, after last Saturday's march of hundreds of Jewish teenagers who came for Shabbat to the city. They called my wife and told her with an Arab accent: we know where you live, we will murder you." The Arabs complain that the garin triggers provocations, but videos and photos taken by the Arabs themselves prove the opposite. A procession of hundreds of Jewish teenagers on Saturday in Jaffa, that marched singing by the sea, led to calls to hurt the members of the garin, including telephone threats and threats to massacre the garin members. 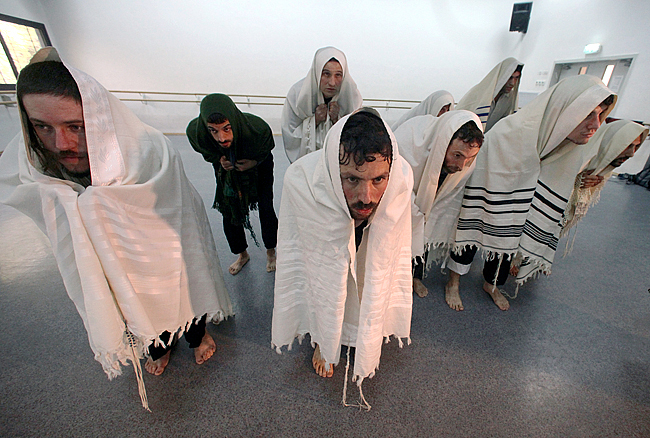 The Torah garin in the city, organized a Sabbath program for Jewish teenagers from across the country. The group marched on Saturday toward the sea to read the "Song of the Sea" [AL: read that Sabbath from Exodus in synagogues]. The procession made its way to raising the flags of Israel and singing in the streets of Jaffa. Arab shouted insults at the procession and threatened that "next time it will not pass." "Another attack on the mosque will bring slaughter"
Dozens of Islamic organizations gathered Saturday night at the community center in Jaffa, and developed courses of action against the Torah garin. Proposed strategies presented at the meeting were land purchases, creating conflicts with the "settlers", as they term them, and creating a popular uprising. Phaedrus Muhammad, a local reporter in the city, reported. The head of Islamic Movement in Jaffa, Sheikh Suleiman Dali said that "another attack of the massacre of hikers will bring slaughter as the residents and worshipers will not be silent over the continuation of the provocations", the Arab news website UMNET reported. Ze'ev V., a resident of Jaffa city and a member of the Torah garin said that yesterday Arabs called his home and threatened his wife with murder. "Someone called from an concealed number with a clear Arabic accent, and told my wife that he knows exactly where we live, he will kill us." The couple contacted the police and filed a complaint. The Arabs claim that the marchers threw stones at the mosque. Photos from Arab sources illustrate that this is a lie. To make things clear. This is Jewish Land, a Jewish State. The Arabs must accept it. There's nothing wrong with our entering all neighborhoods and cities. At the same time, we must treat everyone properly and politely, Jews, Arabs, tourists etc. I don't see any conflict in my selling to Arabs with my politics and ideology. Will There Ever Be Shabbat in The Senate Again? Joe Lieberman, the Shomer Shabbat, Shabbat observing Senator, won't be running for another term. He is rare among American Jews in that he made it in American politics while keeping many of the commandments others considered stumbling blocks. His way of observing Shabbat and other mitzvot, commandments isn't exactly the same as mine, but he is much more Torah observant than your average Jew, whether in the USA or here in Israel. Lieberman's politics is even more unique, having moved from the Left to Center-Right. He's principled and not afraid to change allegiance, reminding me of Chanan Porat, who also changed parties when he felt that another party represented his opinions more accurately. Senator Joseph Lieberman is the first Jewish American to be nominated Vice President by a party with a chance of winning. Lieberman's success surpassed all of the assimilated Jews who felt that Jewish Law would hold them back. People respect Lieberman, davka, for the fact that he's committed to his religion. That's an important lesson. I hope that he enjoys his retirement. The United States, European countries and more invested money and human lives trying to turn Iraq into a civilized western-type of country. Have they succeeded? Was it worth it? Terrorism is still frequent there. Can Iraq become like Indiana? What do you think? What does history teach us? Why Is Bibi Saving Barak? As I've written before, Ehud Barak is not very popular nowadays. I was cynically joking when I wrote in a comment here that he'll end up joining the Likud, but now that seems to be the deal that he and Bibi have cooked up. "...until it gets stuck without enough voters to make the minimum cut... unless he joins Likud as a faction before the next elections." Hat tip:IMRA polls show that Barak really hasn't a chance to get elected on his own. Bibi has been filling/stuffing Likud with all sorts of non-Likudniks to try to push out Moshe Feiglin's Manhigut Yehudit (Jewish Leadership) crowd and others who are more Right and pro-Land of Israel for Jews nationalist. That's one of the reasons they haven't been pulling ahead of Kadima in the polls. In actuality, Binyamin Netanyahu's Likud is just getting more and more similar to Kadima. His bringing in all the opportunists has diluted what little ideology the Likud MK's once had. There aren't too many Ruby Rivlins left in active Likud politics. He just adds some symbolic flavoring, rather than dominating that once ideological party. Now don't forget that the numbers in this poll only add up to sixty-six (66) Knesset seats, unless my addition is off. That means that fifty-four (54) seats aren't listed. I'd be curious as to the predictions for the religious and Right. I'm also pretty sure that if Bibi adds Barak to Likud he'd lose more voters than he'd gain. Next week, Jan. 23-27, hundreds of schools across Israel will designate a special Gush Katif Day or week by learning about the history and relevance of Gush Katif to the country’s development. Those schools that participate in the voluntary program do so in cooperation with the “Gush Katif and Northern Shomron Memorial Law” passed in 2008 and with the approval of the Ministry of Education. The dynamic and engaging programs can include speakers from former Gush Katif communities, relevant videos, and the now available Gush Katif educational kit. These kits, produced by the Gush Katif Committee, are in Hebrew only and provide student-friendly, grade appropriate legacy materials (kit details: Orit Berger, oritberger33@gmail.com). Some 600 schools have already purchased the new Gush Katif educational kits. These schools predominantly represent the state-affiliated religious system. Perhaps this is reasonable to some but this writer thinks education is the key element in molding our future and that of our children. We need to reach out. After all,the forced removal of Jewish citizens and destruction of the Gush Katif communities affected all Israeli citizens regardless of religious and political affiliation. The nation was and remains divided. Is this schism endemic to Israeli society? A Youtube “Gush Katif” search will produce a host of videos, English and Hebrew, from which to select. Facebook offers, in English, the "Gush Katif - historical fiction novel" page introducing "a more personal look and awareness of former GK residents and issues still being grappled." 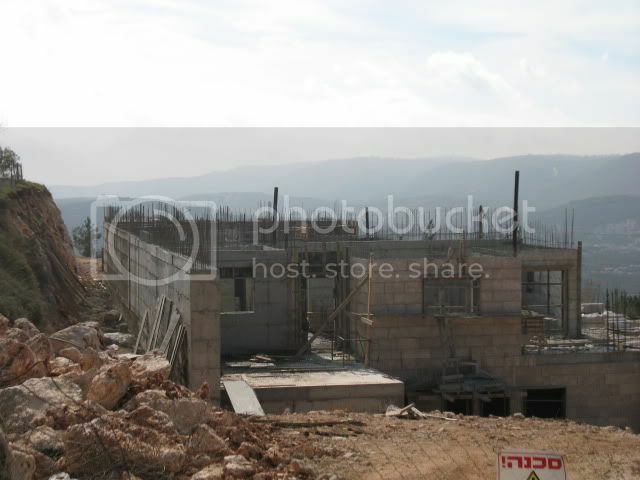 Our enemies can talk all they want, but we're building homes for Jewish families here in Shiloh, Israel. And people are buying, thank G-d.
We're the only people who have a national history here. This is Jewish Land, our Land and there's no way to deny it. Ehud Barak has left the Labor Party. This may be his next exit from politics. He was defeated after being Prime Minister and somehow bounced back, because Binyamin Netanyahu wanted a Center-Left government and appointed him Defense Minister. Ehud Barak isn't all that popular with ordinary Israelis any more. I can't imagine too many people voting for a breakaway party headed by him. Like many former IDF Chiefs of Staff, he was pretty popular early on in his retirement from the army, but his reign as Prime Minister was so terrible, terrorist-terrible, that his luster was quickly tarnished. The Labor Party itself hasn't been doing well in recent elections, and a split is the last thing it needed. It's interesting that Barak is touting his new party/faction as Center, not Left. That should have him fighting with Kadima and Bibi's vision of Likud for votes. 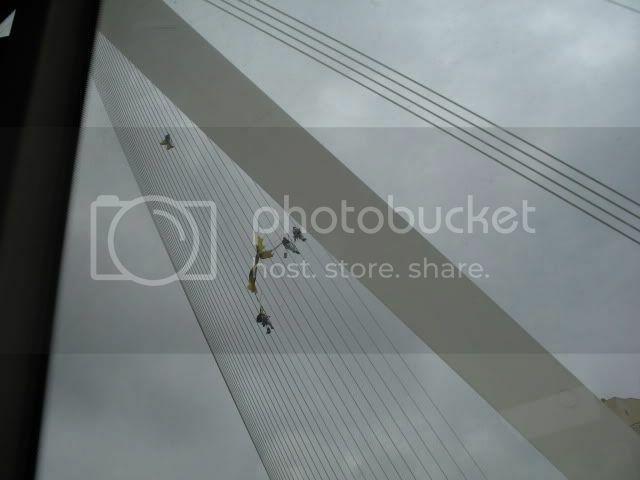 Greenpeace did a spiderman protest on Jerusalem's String Bridge which meant that pedestrians were banned by the police from using it. 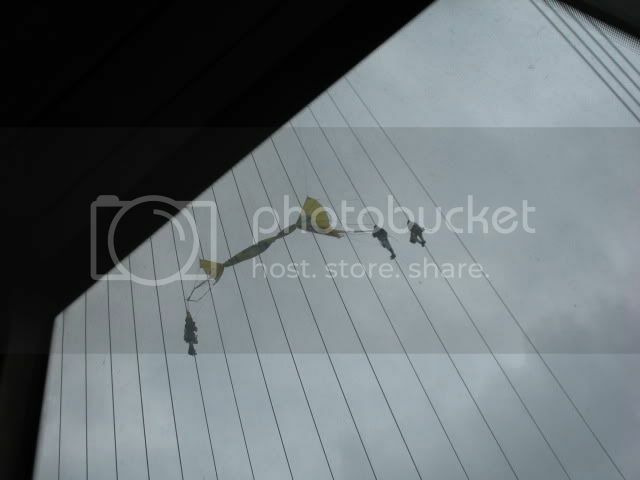 I don't see the connection between the Ashkelon power plant they were protesting and the bridge. 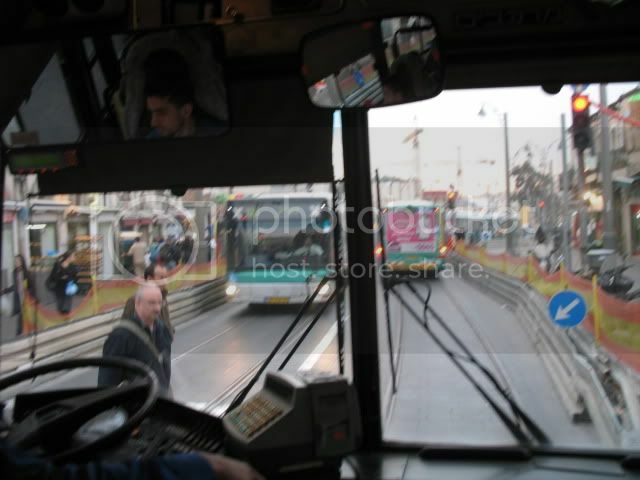 I personally almost missed my bus because of the extra time I had to wait for red lights etc. 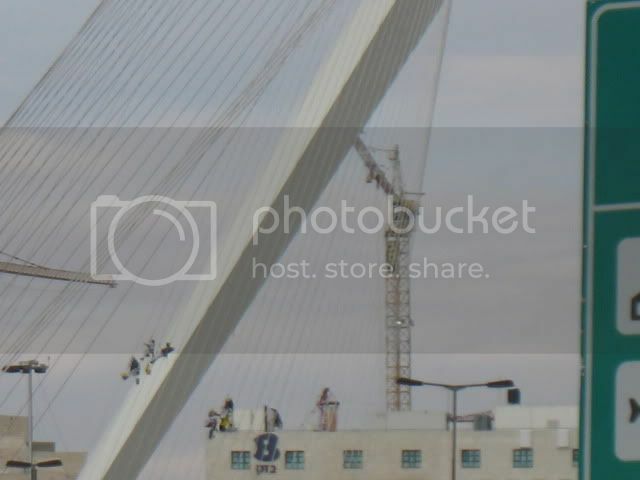 Whether it suits the lightrail or not, the Jerusalem Calatrava Bridge is magestic and apparently the new spot for daring and attention-grabbing demonstrations. 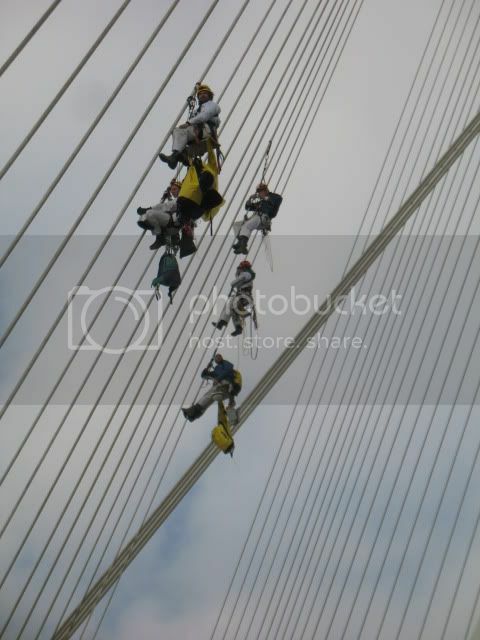 It took six hours for activists to scale the cables that extend 387 feet (118 metres) above Jerusalem, supporting a bridge that resembles a ship's sail and dominates the city's skyline. The climbers displayed their 1,550-square-foot (144-square-meter) sign for 40 minutes, said Theodora Karchovsky, a Greenpeace spokeswoman. Police spokesman Micky Rosenfeld said none of the climbers was arrested. I thought that it has been proven that "global warming" isn't real; it's no more than a myth. It's not that the Left ever lets facts interfere with their ideology and causes. Yes, the 300th Havel Havelim is hosted by To Kiss A Mezzuza. Take a look! It's a great one. Three hundred! Wow! That's amazing. Does that mean that Havel Havelim has been going on for about six years? There's a very wide variety of Jewish blogs out there on the internet. I'm very happy and proud to be part of this fantastic internet community. Thanks to all those involved, including those who just read the posts and comment at most. The other day my daughter greeted me with that statement. Rami Levi, the owner of Yafiz the store I just started working at, put together the deal to keep Nof Zion Jewish. Rami Levi has a chain of discount supermarkets, called Rami Levi, and Yafiz which sells clothes and shoes for the entire family. So, if you're debating between shopping there and in some other discount stores, remember that he does more than just make money for himself. This story does have a happy ending, or you would have read it and heard it on the news. A few days ago I got a call from a kid studying here in Israel. We don't know him, but he got our number from someone who knows us from blogging. "Can I come for Shabbat?" I told him to take the #148 bus, which even has a stop near where he studies. He said that he'd find out the bus schedule. Fine, nice and simple, I figured. "I'm at the bus station. They told me that the bus left ten minutes ago." "It could be. Maybe I can just take a cab to Shiloh." "Not too many cab drivers would be willing, and it's not cheap. Let's see if there are any other buses to the area." We checked it out, and that had been the last bus. "If you really want to come, you can take a taxi to the machsom at Hizme. If you're really lucky, you'll catch the bus there or a ride." "Just say machsom-Pisgat Zeev. The driver will know what you're talking about." Oh, boy, now he'll be breaking my first, most important safety-security tremping (hitchhiking) rule. Only tremp to places you know. You must be familiar with the route. This kid, total stranger to us, not only didn't know the route, he could barely speak Hebrew. "The taxi let me off near a bus stop, and the soldier just asked me what I was doing." "OK, now you need to find a ride either to Ofra or Shiloh, whichever comes first. 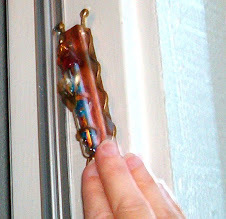 If you end up at Ofra too close to Shabbat time, you can go to my daughter who lives there." I quickly called my daughter who offered to host him even before I could ask. "I'm getting off at Ofra." "Good, now on the main road there's a bus stop. It should be full of people. Wait there. If a car stops ask where it's going. Only if it's going to Shiloh do you get on." "I see a bus stop, but it's empty." "Are you sure it's on the main road?" That got me nervous. It's safer to wait with others. How could the bus stop be empty on a Friday afternoon? "It seems that there's another bus stop around the corner. It has people." "Yes, that's where you should be." "Remember, only to Shiloh, and if you don't get a ride soon, I'll let my daughter know and they'll take you to their house in Ofra." Next time I tried to read him, there was no reception. Now, that's an either good news or bad news situation. Most of the road between Ofra and Shiloh has awful reception. The chances were that he was on his way and just didn't call to tell me before reception went. I kept praying and calling over the next ten minutes. "I guess I'm in Shiloh." "Great! Ask the driver to which neighborhood he's going." "Duh! How do you say that in Hebrew?" "Huh?... Which are you in?" "למעלה limaaleh, up, the upper neighborhood." "So where are you exactly? What do you see?" To make a long story much shorter, I finally sent my husband out to look for him and after giving them each other's phone numbers they met up, and I hope our brave, intrepid guest had a nice Shabbat here. I have been derelict in my duty by not posting about our great loss here in Netivot of Rabbi Yissachar Meir, founder of Yeshivat Ha'negev on January 2nd. I have lived in Netivot for almost 34 years and witnessed first hand the tremendous love and chesed this Rav has shown to all segments of the city's population. For instance, I know a battered wife in town whose eldest son was born with horrific heart defects. In the mid-1960's there was little recourse for someone destitue in need of heart surgery for a child. She entered Rav Yissachar's home crying hysterically. He calmly asked her how much money she needed, and the following day gave her an envelope filled with cash. I can vouch for Rav Yissachar's concern for every yid in Netivot. During my second year of teaching at the local mekif, several pupils of mine became quite religious. One was rejected from the post high school seminary of her choice (as I was secretly informed by a rabbi teaching there,) simply because their quota for sephardic girls was full. Rav Yissachar sent me to Rav Shach to fight this decision. As his dear wife. the Rebbetzin indignantly said, 'What nonsense! As if on Har Sinai Hashem said, 'Ashkenazim, you stand here; Sepharadim, you stand there." People openly scorned and mocked Reb Yissachar 50 years ago for his decision to open a yeshiva gedola in the midst of poverty stricken Netivot which was then a transit camp for indigent North African immigrants. An additional event in the development of Torah in Netivot was the Rosh Yeshiva's efforts to bring the Baba Sali to Netivot. It was Reb Yissachar who proved that Netivot was within the borders of Eretz Yisrael, paving the way for the saintly sage to move to town. The two Torah giants had very close ties throughout their lives. The day of Reb Yissachar's funeral sent me back in time to 1984 when the Baba Sali died. I recalled identical feelings that day long ago. The city was swept with an immense feeling of bewilderment. Who would care for the city? To whom would the misfortunate turn in time of need? We can only hope and pray that these two Gedolim petition the heavenly court for the swift arrival of Moshiach speedily in our days. 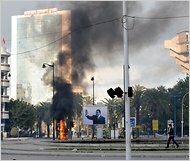 I don't think this Tunisian "uprising" is anything new or unique in the Arab world. Aren't there similarities to the violence in the 1979 overthrow of the Iranian Shah? There was certainly no peaceful transition from Shah Mohammad Reza Pahlavi to Ayatollah Khomeini. And how are things in Iraq? Two more American soldiers were killed there today. I don't feel like doing a thorough research, but I know if I did I'd find many more examples to prove the violence in Arab societies. That's another very important reason that nobody in their right mind can believe that a Pseudostinian AKA Palestinian sic State could be contained, would accept restrictions and would refrain from attacking Israel. The establishment of such a state must be prevented. The enthusiastic support for such a state by United States President Barack Hussein Obama endangers world peace. Countries have been announcing their recognition of the proposed state. Not only would it be extremely dangerous for the continued existence of the State of Israel, but it would embolden Arab and Muslim minorities in countries all over the world. It's better to say no now than deal with that dangerous future. 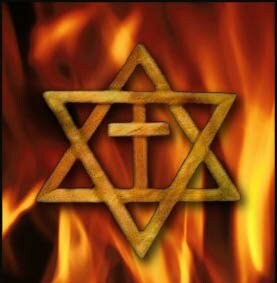 I have quite a number of friends who are converts to Judaism. Some like Chaviva are very public about it, and others, backed by Halacha (Jewish Law,) keep it privately in their past. There are many whose Judaism has evolved which required more than one conversion and even more than one marriage ceremony to the same person. This article, from the OU, tells of one woman's acceptance of Halacha and subsequent conversion. I recommend it as an antidote to those bitter articles by those complaining that their Reform or Conservative Judaism isn't accepted by mainstream Torah Judaism. It's Reform (yes with a capital "R") and Conservative (yes with a capital "C") which are splitting and confusing the "who is a Jew" issue by changing the rules to suit their ideologies, agendas. Only a genuine diamond is a genuine diamond. Rhinestones and zircons aren't, no matter how brightly they sparkle. If you want to be Jewish, don't compromise, go for genuine Torah Judaism. Brain damage is a very complex, spooky topic. As a parent and teacher we wonder how/if any illness or accident can effect a child's mind, learning capabilities. My youngest was very ill with osteomyelitis at the age of two weeks, and the doctors suspected brain damage. He then surprised them by quickly catching up and even being advanced including high IQ. But is his mild learning disability from that or just a genetic quirk? There are mild learning disabilities in both mine and my husband's families. “I believe one day she will be able to think,” Dr. Rhee said. Oops! If all she may end up doing is follow simple physical instructions, the situation is really bad. That means that there's nothing left of her personality, opinions, intelligence. Of course, all of this is hard to know just days after the shooting. Neurological damage, whether from injury, illness or age is so very individual. May G-d give strength to her family and friends. 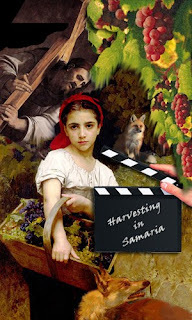 Jewish Israel has previously covered the Waller family and their gospel-inspired grape harvesting expeditions in Samaria. Things have intensified and deteriorated since our initial report of October 2009. The messianic family and their harvesting team collaborated with missionaries in the production of an award-winning documentary that reeks of classical Christian anti-Semitism. Not only is the Waller family featured on the film's posters, which made the rounds at the Cannes and Monaco Film festivals, but their major role in the film's previews are interspersed with scenes of in-your-face street proselytizing directed at Jews. Tommy Waller recently issued an impassioned call for volunteers to help plant, prune and harvest the mountains of Israel in preparation for the "great restoration wedding feast" to take place in Jerusalem between Jesus the groom and his "people/bride". According to Tommy, "Yeshua will not come to a wedding without wine!" This week, when I traveled by bus on Jerusalem's main street, Rechov Yaffo, Jaffa Street, I kept thinking of the day, decades ago, July 1960, when my family went to Brooklyn to take a last ride on the Brooklyn Trolley. My parents and I were born in Brooklyn where most of the clan from both sides lived. We were among the first of our family to adventure out when my parents, as a very young newlywed couple, signed up for the Veteran's Housing being built in Bayside, NY, Bell Park Gardens, an idyllic garden apartment development full of other young families, about 90% Jewish if not more. As I remember, we went to visit one of my mother's siblings, had so much fun visiting and talking that we never got to go on the trolley! Isn't it amazing what kids remember... I have no memories of being on a Brooklyn trolley, but that doesn't mean that it never happened. My mother used to take me to see the family by public transportation, from Queens to Brooklyn, until just before I turned three and my brother was born. 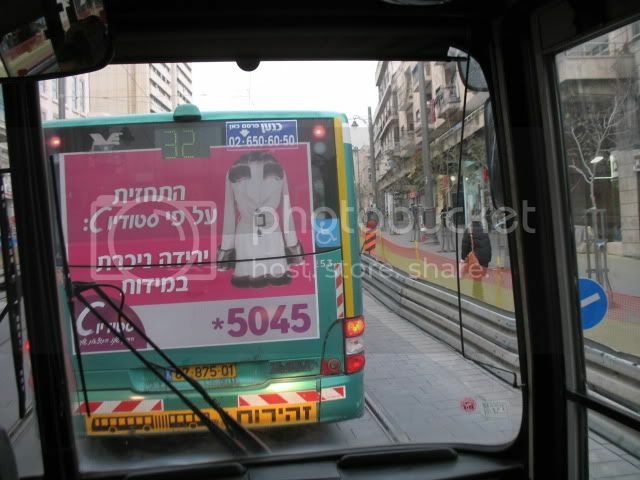 So this week, as I traveled by bus on Rechov Yaffo I just had to whip out my camera and shoot those pictures, while memories of my almost ride on the Brooklyn Trolley rushed to my mind. As you can see, there's barely enough space on Rechov Yaffo near Machane Yehuda open-air market for the two sets of lightrail tracks. There won't be room for buses at all. Taking Bets: Will Huckabee Stay Pro-Israel, Including Jews In Judea-Samaria-If Elected U.S. Pres? Could Huckabee be the exception to the rule? Friends who traveled with him during his Israel trip trust him. Now he's the strongest Republican Presidential hopeful. I'm taking bets. Honestly, I'm a terrible cynic. Could there be brain-zappers that change the opinions of those voted in high office? There was a TV show called The Agency, which had strange machines that could long-distance do a medical exam on a person who didn't know he was being examined. The press is full of articles trying to predict the future survival, life of brain-injured Gabrielle Giffords. She was young and healthy when shot a few days ago. 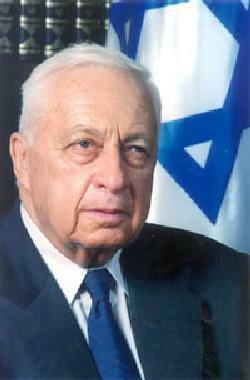 My mind connects this with Ariel Sharon, Israel's former Prime Minister and military hero. He has been in a coma for five years. He was no youngster when he had a series of strokes. The strokes and operations to save his life have left him alive but dead in terms of response and any chance of rehabilitation. I hope that Giffords has a recovery. They say that she responds. Sharon doesn't according to reports. I knew nothing about Gifford before she was shot, but like probably all Israelis and many Jews world-wide I'd been following Arik Sharon for decades. Sharon was a very gifted leader, very charismatic. "When he was good he was very, very good, and when he was bad he was horrid." Of course, Israelis from all sides of the political spectrum would disagree on when he was good and when he was bad, but I highly doubt if anyone followed him on his unpredictable twisting path. Unfortunately, he ended his public career with an all-time low, supporting Disengagement which has left the Israeli south vulnerable to rocket attacks from Gush Katif. Gush Katif, prior to Disengagement, was full of Jewish communities and an amazingly successful Israeli agricultural industry/business. Thousands of innocent Jewish families forced out of their homes are still living in rickety temporary structures. I'll just end this with a good story about Sharon. Just under thirty years ago, he visited Shiloh which then had about thirty to forty families and the hesder yeshiva, which in a five year program combines religious studies with army service. 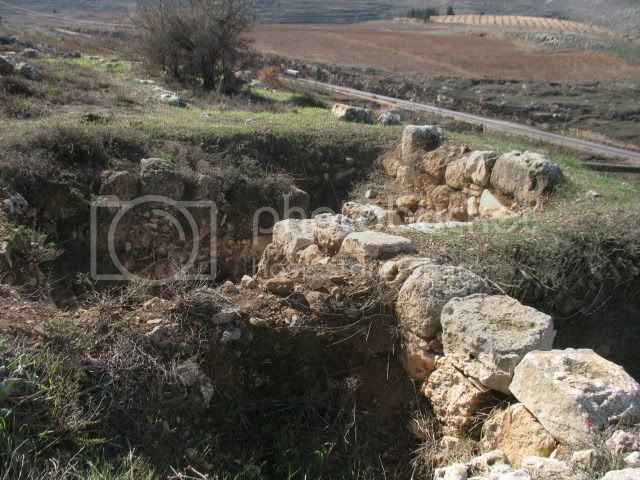 The community was all of three years old and centered around a very old structure near the Tel Shiloh. 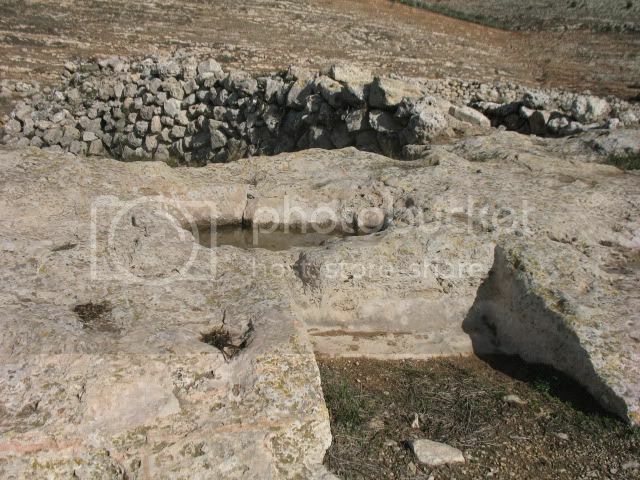 The families had started to plan their permanent housing on the hill to the east overlooking the Tel. Sharon looked around and told them that they were making a mistake. They were planning too small. The hill further east was much larger and could accommodate many more families. 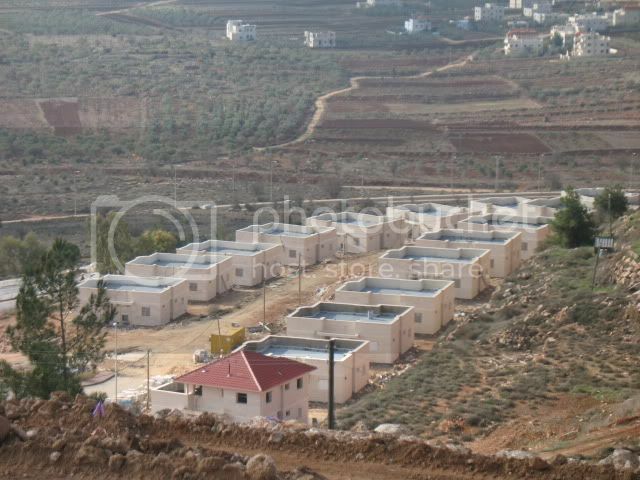 He was then Minister of Housing and immediately allocated fifty top quality, prefabricated cement structures and budget for infrastructure to build a new neighborhood on the larger hill. That's where we and more than half of my Shiloh neighbors live today. hat tip PMW Now Spain is denying that they paid. My enemy's friends aren't my friends, a simple but important thing to remember. As Melanie Philips said on the Israeli news, Israel's hasbara (information campaign) "is a joke!" We're not on the ball, because instead of promoting our Jewish Rights in the HolyLand of Israel, we're marketing beaches and frolicking on the sand. "They planned it as if it was in Arizona, like the Phoenix lightrail." Did I give Arizona an "eyin haraa," evil eye, like a jinx? The Tucson, AZ terror attacker murdered a little girl who was davka born on 9-11, the date of America's largest terrorist attack. If that had been the plot of a book, nobody would have accepted it. Congresswoman Gabrielle Giffords, whose Jewishness is not accepted by mainstream Torah Judaism, may have been targeted because of her Jewish identity. There's no proof that Jared Loughner shot her for that reason, mainly because he has not been cooperating with the authorities and hasn't revealed his motivation. Everything so far is guess-work. I guess Arizona isn't all that safe. There's deadly hatred all over. Is this connected to George Friedman's theories, predictions about the next decade? It certainly looks like things are getting more dangerous all over the world. The Arabs, the Muslims aren't afraid. They are enthusiastic and aren't restricted by PC norms and morality. If we're going to defeat terrorism of all stripes, we must open our eyes and take off the gloves. They won't be destroyed by Lala Left sweetness. They consider their enemies weak jokes and they're right about it. We must fight force with force. Why should the world (and Leftist Israelis) be so concerned over some 1930's building when they feel nothing for our ancient Jewish historical connection with the Land of Israel? That building is less than a hundred years old. There never was an independent Arab Nation here. But the Jewish People have a national history here. These enormous stones were carved and used for building for Jewish purposes thousands of years ago, which Shiloh was the Capital of the Jewish Nation in the Land G-d gave to us. We have every right to be here in Shiloh and in Jerusalem which succeeded Shiloh as Capitol. Actions undertaken yesterday (Sunday), 9.1.11, at the Shepherd Hotel were conducted by private individuals in accordance with Israeli law. The Israeli government was not involved. There should be no expectation that the State of Israel will impose a ban on Jews purchasing private property in Jerusalem. No democratic government would impose such a ban on Jews and Israel will certainly not do so. Just as Arab residents of Jerusalem can buy or rent property in predominantly Jewish neighborhoods in Jerusalem, Jews can buy or rent property in predominantly Arab neighborhoods in Jerusalem. The Melanie Philips interview is the best thing I've seen on Israeli TV in a very long time. By calling Israeli Hasbara Information a "joke," she shocked the veteran Israeli newscaster Yaakov Achimeir, who then tried to convince her that a Pseudostinian aka Palestinian sic State would be a good solution. I wish she had been less polite, but then maybe they would have censored out her reply. It was a real pleasure to hear common sense on Israeli TV News. No surprise that it came from a woman! 299 Agaroth for Havel Havelim! Ya'aqov's back in the saddle, with the 299th Havel Havelim. There are lots and lots of posts from all over the jblogging world. I hope to find the time to check them all out. Please do, too. There are posts for every taste and opinion. Ya'aqov's Hevel Havelim is just what a Jewish blogging carnival should be. What's a Jew? One of my Only in Israel stories. Can anyone with some Jewish genes just decide they're Jewish? Can the Israeli Knesset (Parliament) define Judaism? Is the Hitler-Nazi definition of a Jew something we must take seriously? Are those converted Reform, Conservative (non-Torah standard Orthodox Jewish Law tradition) actually Jews? All sorts of celebrities, including politicians and lots of ordinary people make decisions about whether or not they're Jewish. Now people are asking if American U.S. Rep. Gabrielle Giffords (D-Ariz.) is Jewish. Apparently, she's descended from Jews on her father's side, which is good enough for her local Reform shul. But the Reform definition of who's a Jew isn't based on Torah tradition. Actually, it began during Passover when my neighbor was sent to Russia to run the seder in a Soviet Jewish community. He had a lovely young teenage translator who told him that her family would be making aliyah soon. So he invited them to come to Shiloh. "They called to confirm that they could stay with us. We said yes, although we can't figure out how to fit them in the house." "No problem," I said, "they can stay with us. We have much more room." "They called from the airport. Their Israeli relatives told them that they ought to tell us something they had never mentioned before. Only the father is Jewish, not the mother and the kids. They want to know if we'll still host them. I said yes." "OK, me, too. Let's give them a chance." We had this surreal drive from Jerusalem to Shiloh with a stop off where someone gave them some family heirlooms which he had smuggled out of the USSR for them. Then we set them up with beds, the son at my neighbors and the parents and daughter at my house. "I always knew that marrying - would mean that I and my children would be Jews." So, conversion courses were also found for them.
" -- and the kids converted. We're getting married next week and we want you at the wedding." It was a beautiful wedding, and we hosted Sheva Brachot for them. What's An Orator? Who's A Great One? Oy Gevalt, Bibi, Don't You Get It?